Several media outlets have recently  struggled with proper disclosure of Romney advisers and other figures  closely involved in the upcoming elections; CNN's move is a step in the right direction. 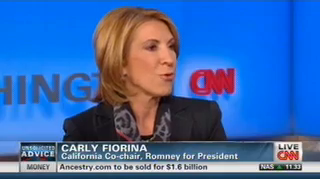 As Media Matters noted , Fiorina made several appearances on CNN in September and October, frequently boosting Mitt Romney while attacking President Obama with a range of often-false Romney campaign talking points. During those appearances, Fiorina was identified in a variety of ways, such as former CEO of Hewlett-Packard; chair of the charity group Good360; former Republican Senate candidate and vice-chair of the National Republican Senatorial Committee. 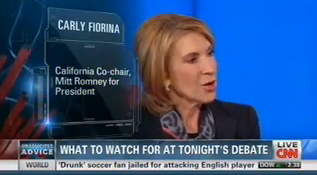 In addition to being the California Co-Chair of Romney's campaign, Fiorina has also been named to the Women for Mitt National Advisory Board .